Five oversized greenhouses shelter six Yeomiji indoor gardens. These glass gardens bud off the observatory and centre hall - the entire building looks like a huge UFO. A bit peculiar but it's also towering and a massive structure. The indoor greenhouse gardens are impressive... they're the largest in Asia. In this case, bigger is better... they house an extensive and diverse cache of native and international flora. First of Yeomiji indoor gardens, the Flower Garden. 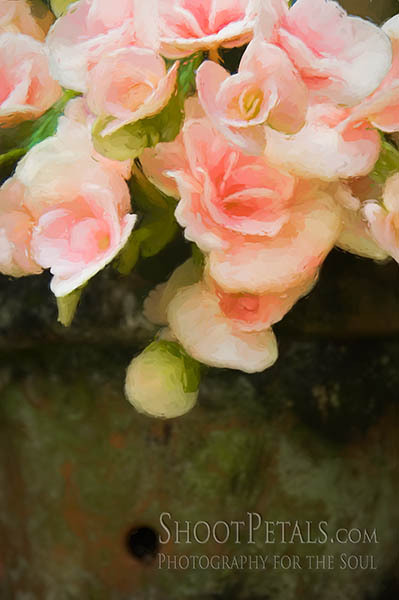 A painterly photo - part of a large begonia collection. You'll have to discover the sub-menus for yourself. But I will give you some teasers. If it's rainy season, you'll be grateful for staying high and dry in one of the glasshouses. Since you can go where you wish with a day's entrance fee, the indoor gardens are insurance that you won't be disappointed if you visit in the rainy season. The weather changes on a dime over the day. You'll have lots of opportunities to visit one or more of the outdoor gardens while the rain starts and stops. When it starts, hustle back and pick up where you left off indoors... don't forget to protect your camera from the rain. When you come into the Centre Hall, the Flower Garden is the first greenhouse on your left. This is where you'll find the orchids, and who doesn't love orchids? But orchids aren't the only bloomers in this garden. Plenty of other flowers live in the Flower Garden. 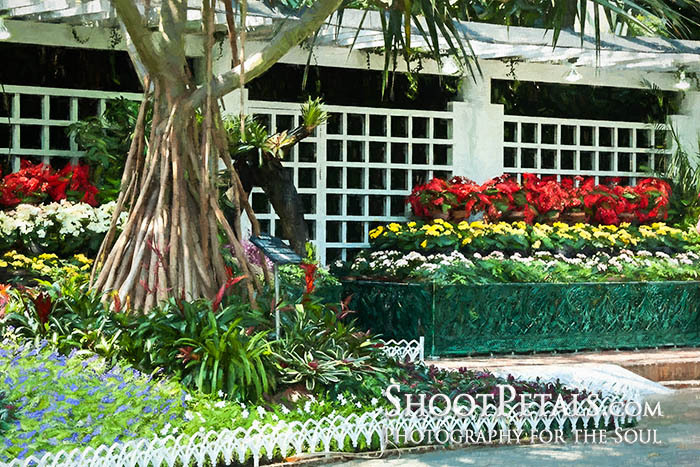 There's an impressive begonia display on the far side... check the picture up top to see part of the exhibit. The lighting isn't always the best for photography when the sun's beating down on the greenhouses. It gets a little spotty with dark shadow and bright light. You might need to use just a bit of fill flash to even out the light. Only use fill flash so you don't create dark ugly shadows with a full-on assault of bright light. Yeomiji indoor gardens. 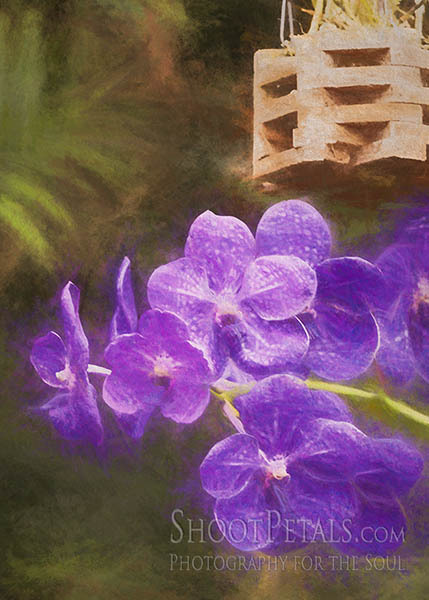 Painterly orchids in a basket. A pool snakes its way along the centre of this glasshouse. The water is soft turquoise like a tropical sea. Several fountains spray water into the air. The sound of the water splashing into the pool is comforting. Since the Yeomiji indoor gardens are such a popular attraction, during busy hours visitors' voices can compete with the relaxing sounds of water. I prefer solitude and the tranquility of the water, but that isn't always an option. Your best shot at peace and quiet to meditate or focus on photography is the first hour or so after opening in the morning. At least, that's my experience. Yeomiji indoor gardens attract multitudes of tourists and local visitors throughout the year so solitude isn't the norm. One autumn I visited during Korean Thanksgiving (Chuseok) and the entire island felt deserted. Everything was open for tourists but very few people around... all a little eerie. The gardens belonged only to me... and that was awesome! How about more heavenly orchids? They're right here. 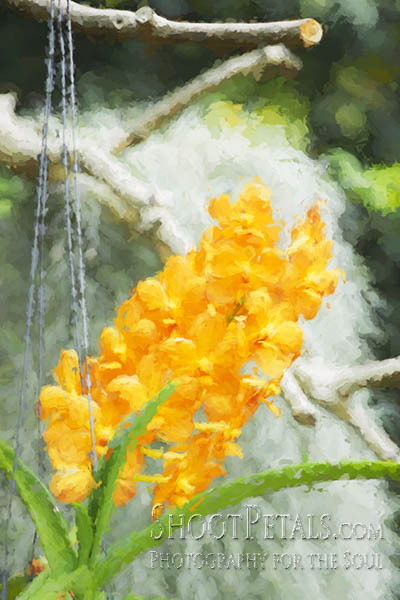 Painterly Vanda orchids, Yeomiji indoor gardens. The Vanda orchids are hanging around in baskets on the orchid side of their greenhouse. Vandas are at home in Asia... they love a warm environment and they found it here. Their blooms are stunning and they're big sellers in the flower market. There are around 80 species if you want to try growing some. Orchids share the first of the Yeomiji indoor gardens with over 300 other varieties of flowering plants but, after orchids, I spent most of my time photographing begonias. There's a large display along the far wall. The mossy pots caught my attention and I photographed several of them. One of those images is at the bottom of the page... a soft pink begonia that looks so pretty with the green and orange mossy pot. The gorgeous scents in the air are overpowering in this glass house. I always try to get there early when there were no crowds, I sit on a bench and take in all the gorgeousness around me. Jeju Island is a horticultural paradise and water gardens are a dominant feature. Water is the primary substance that supports life, both our own lives as well as all other plant and animal life. It goes beyond the physical and embraces the spiritual. Science proves that being near bodies of water reduces stress, improves performance and makes us happier and healthier. Haven't experienced a profound change in your physical and mental state after a week at the lake or the ocean? Even a few hours or a day is enough to create a noticeable change. On their own gardens are healing environments but adding a pond or a small waterfall multiplies their restorative effect It shouldn't be a big revelation that bodies of water are integral parts of so many gardens. Blue Australian Water Lily in Yeomiji Indoor Gardens - the Aquatic greenhouse. Yeomiji indoor gardens have their share of ponds and fountains. Keep going to the water lily ponds in the next greenhouse... flower photographers love these delicate flowers. Reflections make it doubly good! There's papyrus here, too - the original writing paper! Papyrus loves to sink its feet into water. Sit back and enjoy this minute of video entertainment. Brought to you by Me :) and the Waterlily Garden in the Yeomiji indoor gardens. 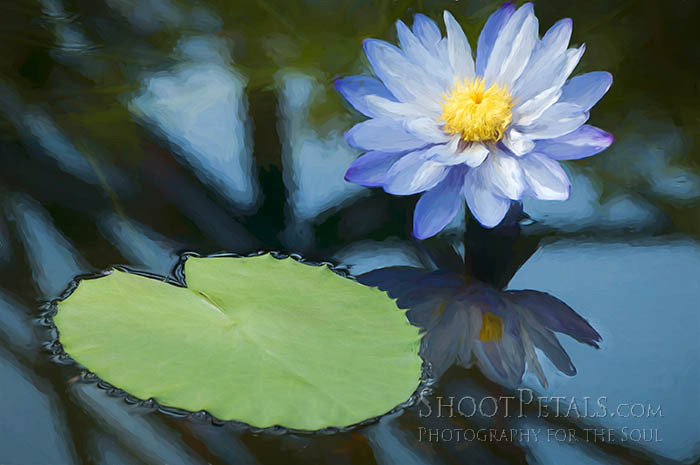 Love waterlilies? You'll find more of them here. ... A Delicious Array Of Yummy Treats! Asian Jack fruit ... one weighed 40 kg - that's a whole lot of eating! By the way, Jack fruit is a healthy fruit and versatile in cooking. One of my favourites... coffee. Yum, my morning latte. And more luscious fruit, bananas. papayas and mangoes. Here in North America, even from the best organic stores, we can't get the quality of mango and papaya that I ate in Asia. And those small creamy bananas... mouthwatering... no supermarket banana comes close to the taste. In this garden with all the scrumptious stuff, it's easy to find interesting patterns and lines in the exotic fruits -- a macro lens would come in handy if you have one. 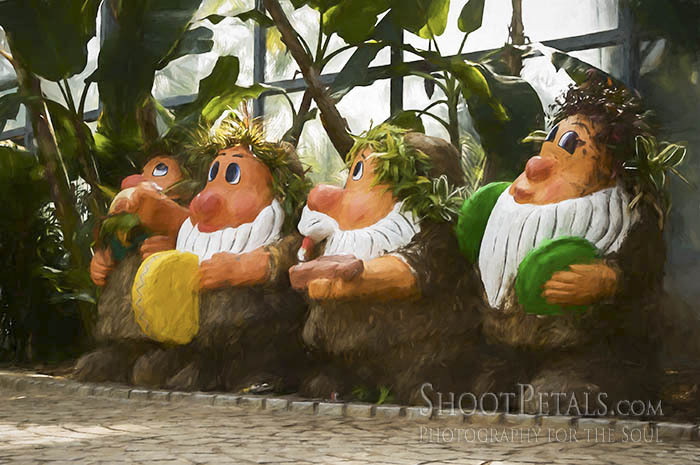 Four of the 7 adorable dwarfs, Snow White's friends, in the Tropical Fruits Garden. Snow White's cottage, and Snow White herself, were right beside these fellows. When I went back several months later, they'd disappeared. Too bad since the kids loved Snow White and her wee buddies. Hopefully, they'll resurface from time to time. These are the perfectly adorable scenes worth photographing when you get the opportunity. I love sharing my images with other people and one way of doing that is with note cards. Flowers are profuse here on Vancouver Island. And, I've been so lucky to travel the world for the last 20 plus years. I've visited all kinds of gardens in so many different countries.... with pictures to keep as memories! 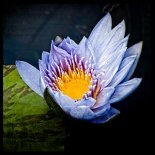 If you'd like to share my images with your friends and family, have a look at my Fine Art Flower Prints and Note Cards. I'm doubly lucky to live by the ocean on Vancouver Island, so there's also a page for Fine Art Prints for Seaside Life - the sea lions, herons, eagles and more. 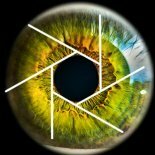 If you don't see the card image you want, contact me and tell me what image you'd like. ... Looks and Feels Like the Amazon! We're in a rain forest ecosystem now, just like the Amazon Jungle! The vegetation is thick with tall palms and rubber trees... ferns and other dangling jungle plants everywhere... lots of insectivorous plants. Great photo material. Because of the dense growth, it can be a bit dark and you may need to use fill flash or longer exposures. You have to be within 6 or 8 feet for flash to be of any use. Don't bother if you're 20 feet away. 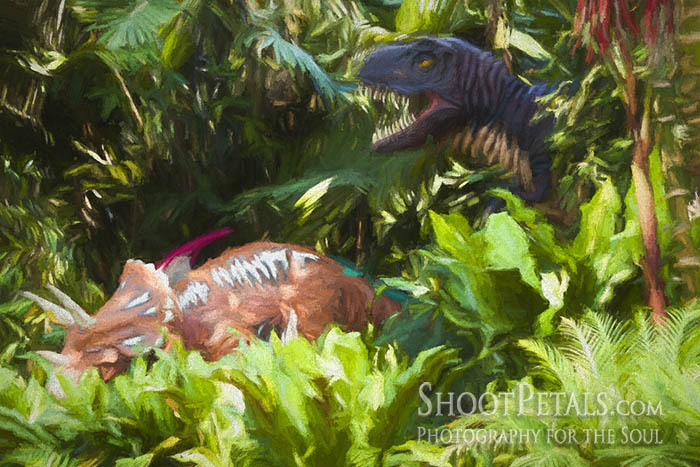 These two fellows are just chilling together... but not in an ordinary tropical jungle. They have a couple of alligator buddies and some giant Mesozoic flowers and ferns to fancy up the swamp. It's a bit of a mix from the Mesozoic era right up to the present. It shows how far back some plant origins reach. Like the tree fern. Ferns in general date all the way back to the Jurassic Period. An incredibly resilient group. They've lived alongside the dinosaurs and survived all kinds of climatic cataclysms and they look as good today as they did then. Prime subjects for photography and I often use close-up or macro photos for textures or backgrounds. Yeomiji Indoor Gardens, the Jungle Garden with a pair of dinosaurs in the swamp. There are almost 500 prickly cacti species right here in this greenhouse at Yeomiji Botanical Garden. A phenomenal place to find lots of lines and patterns. Try some close-ups or use a macro lens if you have one. Try out a Lensbaby! Don't have one? I purchased a Velvet 56 soft focus lens about a year ago. Find a camera shop that rents them. Try before you buy. 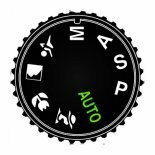 There are several types of Lensbabies and two soft focus lenses. The newer one is the Velvet 85 and the reviews are excellent. Not everyone likes soft focus, but if you do you'll have a blast with Lensbaby. Cacti in the Desert Greenhouse at Yeomiji Garden. 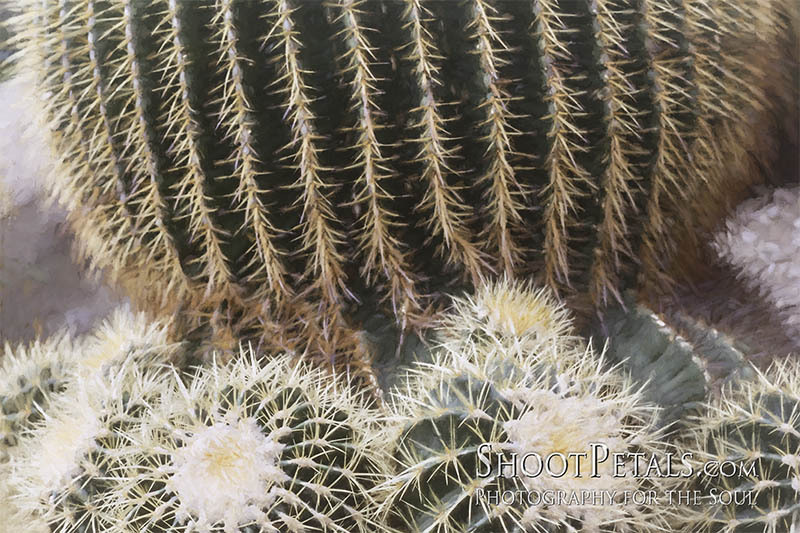 Rows of rounded cacti with their barbed needles make artistic patterns and textures to photograph. You wouldn't want to sit on any of these... ouch! If you only have your cell phone with you, you can still get great photos. There are so many apps to help you out with exposure, background textures... the time to research and practice is before you go to a garden like this. Learn how to get more out of your cell phone camera. You don't always need a fancy DSLR. If you'd like to improve your iPhoneography, start here. You can control your exposure so you don't have to leave it up to your cell phone camera to decide. You can get tiny lenses (like Olloclip) that give you more flexibility in your photos. There are countless apps that give you fabulous creative options using your cell phone camera! Research, learn, and practice.... be ready for the big events when you want to get the great pictures. Yeomiji Indoor Gardens, a mossy pot of dainty pink begonias. It won't come as a shock to you, but I've read a few articles lately saying that Jeju Island is experiencing too much tourism... the environment and culture are suffering. Right, no surprise there. Just a reminder that if you visit, please "leave no trace". Unfortunately, we humans are leaving our mark on the world and not in a good way. When the animals and plants suffer, we have to evaluate our actions. There are so many places I still want to see in the world but everything is changing so quickly. Plants are the raw materials of both Eastern medicine and Western pharmaceuticals. Plants supply us with paper we use to communicate, raw materials for homes and furniture, as well as our food. Not only do we eat plants but if you eat some form of meat, you can thank plants for being the food for other animals. Plants are the raw material of the energy we pump out of the ground as well as the oxygen we breath. 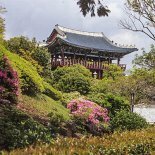 If the Yeomiji indoor gardens are the last of all the gardens you've visited in this incredible botanical garden, you'll have an appreciation for all that plants do for us. It's imperative that we undertake their care and preservation very seriously.